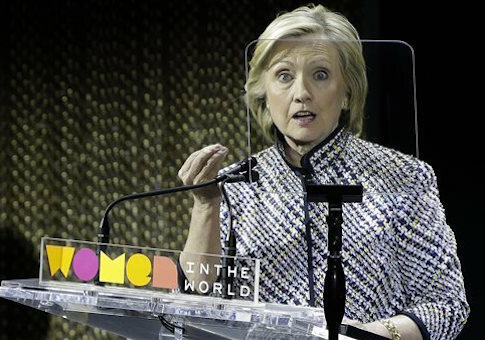 Large portions of Hillary Clinton’s $14-million memoir Hard Choices are copied from more than a dozen public speeches, congressional testimony she made while serving as secretary of state, and her previous book Living History, a Washington Free Beacon analysis found. Other passages mirror writing from other authors, including a speech given by her husband, Bill Clinton, in 1998, and an op-ed co-authored by Adm. James Stavridis, the former military commander of NATO, in the New York Times in 2011. Clinton also appears to have recycled a sentence from Hard Choices in her review of Henry Kissinger’s book World Order, which appeared in the Washington Post on Sept. 14, 2014, three months after her book was published. The book does not cite the segments that were drawn from prior speeches or note that the speeches were used in the acknowledgements. This vast region, from the Indian Ocean to the tiny nations of the Pacific, is home to more than half the world’s population, several of our most trusted allies and valuable trading partners, and many of the world’s most dynamic trade and energy routes. U.S. exports to the region helped spur our economic recovery in the wake of the recession, and our future growth depends on reaching further into Asia’s expanding middle-class consumer base. Asia is also the source of real threats to our own security, most notably from North Korea’s unpredictable dictatorship. This vast region, from the Indian Ocean to the Western shores of the Americas, is home to half the world’s population, several of our most trusted allies, emerging economic powers like China, India, and Indonesia, and many of the world’s most dynamic trade and energy routes. Surging U.S. exports to the region are helping drive our economic recovery here at home. And future growth depends on reaching further into Asia’s growing consumer base and expanding middle class. In a passage extolling the Global Counterterrorism Forum, Clinton borrows language from a speech she made before the group at its inauguration on June 7, 2012. They’ll bring together experts on communications who understand how to undermine extremist propaganda, and law enforcement agents who can help governments and communities learn to protect themselves from terrorists. They’ll also work with educators who can devise curricula free of hatred and give teachers the tools to protect at-risk children from recruitment by extremists. Think of what the center can do: Bring together experts on communications who understand how to undermine terrorist propaganda; the smartest minds on law enforcement, who can help governments and communities learn to ward off extremism and expose intruders; scholars of education, who can devise curricula free of hatred and give teachers the tools to protect at-risk children from recruitment by extremists. The same qualities that made the internet a force for unprecedented progress—in its openness, its leveling effect, its reach and speed—also enabled wrongdoing on an unprecedented scale. It’s well known that the internet is a source for nearly as much misinformation as information, but that’s just the beginning. Terrorists and extremist groups use the internet to incite hate, recruit members, and plot and carry out attacks.Human traffickers lure new victims into modern-day slavery.Child pornographers exploit children. Hackers break into financial institutions, retailers, cell phone networks, and personal email accounts. [Th]e qualities that make the internet a force for unprecedented progress—its openness, its leveling effect, its reach and speed—also enable wrongdoing on an unprecedented scale.Terrorists and extremist groupsuse the internet to recruit members, and plot and carry out attacks.Human traffickers use the internet to find and lure new victims into modern-day slavery.Child pornographers use the internet to exploit children.Hackers break into financial institutions, cell phone networks, and personal email accounts. In the aftermath of World War II and the Holocaust, many nations were pressing for a statement of this kind to help ensure that we would prevent future atrocities and protect the inherent humanity and dignity of all people. The Nazis were able to pursue their crimes because they were able progressively to constrict the circle of those defined as humans. This cold, dark region of the human soul, where people withdraw first understanding, then empathy, and finally even the designation of personhood from another human being, was not, of course, unique to Nazi Germany. The impulse to dehumanize has reappeared throughout history, and it was precisely this impulse that the drafters of the Universal Declaration hoped to restrain. They discussed, they wrote, they revisited, revised, and rewrote. They incorporated suggestions and revisions from governments, organizations, and individuals around the world. It is telling that even in the drafting of the Universal Declaration there was a debate about women’s rights. The initial version of the first article stated, "All men are created equal." It took women members of the Commission, led by Hansa Mehta of India, to point out that "all men" might be interpreted to exclude women. Only after long debate was the language changed to say, "All human beings are born free and equal in dignity and rights." At 3:00 in the morning on December 10, 1948, after nearly two years of drafting and one last long night of debate, the president of the UN General Assembly called for a vote on the final text. Forty-eight nations voted in favor, eight abstained, none dissented, and the Universal Declaration of Human Rights was adopted. It made clear that our rights are not conferred by governments; they are the birthright of all people. It does not matter what country we live in, who our leaders are, or even who we are. Because we are human, we therefore have rights. And because we have rights, governments are bound to protect them. In the aftermath of World War II, many nations pressed for a statement of this kind to help ensure that we would prevent future atrocities and protect the inherent humanity and dignity of all people. And so the delegates went to work. They discussed, they wrote, they revisited, revised, rewrote, for thousands of hours. And they incorporated suggestions and revisions from governments, organizations, and individuals around the world. Despite some day-to-day differences, the strategic fundamentals of our relationship with India—shared democratic values, economic imperatives, and diplomatic priorities—were pushing both countries’ interests into closer convergence. We were entering a new, more mature phase in our relationship. The strategic fundamentals of our relationship—shared democratic values, economic imperatives and diplomatic priorities—are moving us closer to an understanding and a trust that reflects the convergence of values and interests. To grow and prosper, we both need open, free, fair, and transparent global economic systems. We both seek security and stability in South Asia and the Asia Pacific. And we understand the critical importance of a coordinated international response to violent extremism and other shared global challenges. As a result, under President Obama’s and Prime Minister Singh’s leadership, we are forging a new and more mature phase in our critical bilateral relationship, one defined by near-constant consultation aimed at advancing the interests and values we share, and working through the inevitable differences. By contrast, democracy provides critical safety valves for societies. It allows people to select their leaders, gives those leaders legitimacy to make difficult but necessary decisions for the national good, and lets minorities express their views peacefully. It allows people to select their leaders, it gives those leaders legitimacy to make difficult but necessary decisions for the national good, and it lets those in the minority express their views peacefully, and that helps ensure stability and continuity through political transitions. This nerve center in Washington would link with military and civilian teams around the world and serve as a force multiplier for our embassies’ communications efforts to preempt, discredit, and outmaneuver extremist propagandists. We would expand our small "digital outreach team" into a battalion of communications specialists fluent in Urdu, Arabic, Somali, and other languages who could do battle with extremists online and answer anti-American misinformation. The nerve center in Washington is linking up to military and civilian teams around the world and serving as a force multiplier for our embassies’ communications efforts. Together, we are working to pre-empt, discredit, and outmaneuver extremist propagandists. A digital outreach team of tech savvy specialists—fluent in Urdu, Arabic, Somali—is already patrolling the web and using social media and other tools to expose the inherent contradictions in al-Qaida’s propaganda and also bring to light the abuses committed by al-Qaida, particularly the continuing brutal attacks on Muslim civilians. Portions of chapter 13 of Hard Choices—titled, "Africa: Guns or Growth? "—draw from Clinton’s speeches as well. Several of the fastest-growing economies in the world are in sub-Saharan Africa. Since 2000, trade between Africa and the rest of the world tripled. Private foreign investment surpassed official aid, and it is expected to continue growing.… Over the same period, child mortality rates declined while primary school enrollment increased. More people gained access to clean water and fewer died in violent conflicts. Africa now boasts more cell phone users than either the United States or Europe.For example, the Chinese policy of noninterference in a nation’s internal affairs meant ignoring or abetting the corruption that was costing African economies an estimated $150 billion a year, scaring away investment, stifling innovation, and slowing trade. Well, just look at Africa today: one of the fastest growing regions in the world; home to six—soon to be seven—of the world’s 10 fastest growing economies. In the past decade, trade between Africa and the rest of the world has tripled, private foreign investment has surpassed official aid, and it will surely keep rising. For example, in the last 10 years, child mortality rates have declined while primary school enrollment has increased. More people have gained access to clean water and fewer have died in violent conflicts. More than 315 million people began using mobile phones. … Corruption costs Africa an estimated $150 billion a year. It scares away investment, stifles innovation, and slows trade. According to the United Nations, consumer spending in a single sub-Saharan African country, poverty-stricken Equatorial Guinea, was $878 million in 2009. The country boasts some of the best highways in Africa—which I saw when Bill and I visited in 1998—nearly universal primary education, and one of the longest life expectancies on the continent. At your independence three decades ago, Botswana was among the poorest countries on Earth, with only 2 miles of paved roads and one public secondary school. Today, you have a vibrant economy, a network of major highways, almost full enrollment in primary schools, and the longest average lifespan in sub-Saharan Africa. This passage was removed from the paperback edition of Hard Choices. A notice on the paperback edition’s copyright page reads: "A limited number of sections from the hardcover edition has been cut to accommodate a shorter length for this edition. Those sections remain available in the ebook edition." The passage was not excised from the most recent Kindle ebook version available on Amazon.com. Other passages are nearly identical to congressional testimony given by Clinton on various occasions. For me, smart power meant choosing the right combination oftools—diplomatic, economic, military, political, legal, and cultural—for each situation. We must use what has been called smart power, the full range of tools at our disposal—diplomatic, economic, military, political, legal, and cultural—picking the right tool or combination of tools for each situation. Over the next year we would triple the number of diplomats and development experts and other civilian specialists on the ground in Afghanistan, expanding our presence out in the field nearly sixfold. By the time I left State, the Afghans had made progress. Economic growth was up and opium production was down. Infant mortality declined by 22 percent. Under the Taliban only 900,000 boys and no girls had been enrolled in schools. By 2010, 7.1 million students were enrolled, and nearly 40 percent of them were girls. Afghan women received more than 100,000 small personal loans that allowed them to start businesses and enter the formal economy. Hundreds of thousands of farmers were trained and equipped with new seeds and techniques. Since January 2009, we have tripled the number of diplomats, development experts, and other civilian specialists on the ground in Afghanistan, and we have expanded our presence out in the field nearly six-fold. And these new civilians have changed the way we do business, focusing on key ministries and sectors, and holding ourselves and our partners to higher standards. And there should be no doubt about the results of our investment, despite the very difficult circumstances that you all know so well. Economic growth is up, opium production is down. Under the Taliban, only 900,000 boys and no girls were enrolled in schools. By 2010, 7.1 million students were enrolled, and nearly 40 percent of them girls. Hundreds of thousands of farmers have been trained and equipped with new seeds and other techniques. Afghan women have used more than 100,000 microfinanceloans. Infant mortality is down 22 percent. Clinton’s discussion of the NATO bombing campaign in Libya and an October 2011 New York Times op-ed by Ivo H. Daalder and James G. Stavridis present facts in virtually the same order and use many of the same statistics and phrases. Fourteen allies and four Arab partners contributed naval and air forces to the mission. 14 NATO members and 4 partner countries provided naval and air forces for NATO’s three missions. [O]ur allies—not us—flew 75 percent of the sorties and were responsible for striking 90 percent of the more than six thousand targets destroyed in Libya. That was a nearly exact reversal of the distribution of labor a decade before, during NATO’s intervention in Kosovo, when the United States was responsible for 90 percent of the bombing of air defenses and military targets. The non-U.S. NATO and coalition partners flew 75 percent of the sorties overall. Ten years earlier, in NATO’s war in Kosovo, the United States was responsible for dropping 90 percent of all precision-guided munitions, with other allies responsible for the remaining 10 percent. In this operation, the percentages were reversed: Allies struck 90 percent of the more than 6,000 targets destroyed in Libya. And though Britain and France led the way with their capable militaries, the effort extended beyond them. Italy dedicated seven air bases to hosting hundreds of allied jets. France and Britain played an extraordinary part in the operation, leading the pack in providing air and naval assets and striking over 40 percent of all targets. Italy, too, made an outstanding contribution. Not only was it the fourth largest contributor to the strike mission, it was an indispensable host to hundreds of aircraft at seven airbases. The Greek, Spanish, Turkish, and Romanian navies helped enforce the arms embargo at sea. And Spain, the Netherlands, Turkey, Greece and Romania played useful parts, enforcing the no-flight zone and arms embargo at sea. Fourteen allies and four Arab partners contributed naval and air forces to the mission. The United States provided unique capabilities but our allies—not us—flew 75 percent of the sorties and were responsible for striking 90 percent of the more than six thousand targets destroyed in Libya. That was a nearly exact reversal of the distribution of labor a decade before, during NATO’s intervention in Kosovo, when the United States was responsible for 90 percent of the bombing of air defenses and military targets. And though Britain and France led the way with their capable militaries, the effort extended beyond them. Italy dedicated seven air bases to hosting hundreds of allied jets. Belgian, Canadian, Danish, Dutch, and Norwegian planes, as well as jets from the United Arab Emirates (UAE), Qatar, and Jordan, all contributed to the more than twenty-six thousand sorties. The Greek, Spanish, Turkish, and Romanian navies helped enforce the arms embargo at sea. It was a true team effort, just as NATO was intended to be. In all, 14 NATO members and 4 partner countries provided naval and air forces for NATO’s three missions. While U.S. planes flew a quarter of all sorties over Libya, France and Britain flew one third of all missions—most of them strikes—and the remaining participants flew roughly 40 percent. The non-U.S. NATO and coalition partners flew 75 percent of the sorties overall. Ten years earlier, in NATO’s war in Kosovo, the United States was responsible for dropping 90 percent of all precision-guided munitions, with other allies responsible for the remaining 10 percent," they wrote. "In this operation, the percentages were reversed: Allies struck 90 percent of the more than 6,000 targets destroyed in Libya. And they did so with a precision that is historically unprecedented. Four key Arab partners—the United Arab Emirates, Qatar, Jordan and Morocco—participated in the effort. And it acted on the basis of a clear U.N. mandate, which authorized taking the necessary measures to protect Libyan civilians. The passage quoted above was also removed from the paperback edition of Hard Choices. The op-ed is not cited in the book. Daalder is among the 240-some individuals thanked in the acknowledgments section of Hard Choices, though his contribution to the book is not specified. Another passage dealing with NATO uses language similar to that found in an interview with Michael E. Brown, the dean of George Washington University’s Elliott School of International Affairs, which was published in the Fall/Winter 2008 edition of GW Magazine. When the United States was attacked on September 11, 2001, European nations stood with us without hesitation. A headline in the French newspaper Le Monde proclaimed, "We are all Americans." The day after the attack, NATO (the North Atlantic Treaty Organization) invoked Article V of the Washington Treaty for the first time in history, which stipulates that an attack on one ally is an attack on all of the allies. The United States experienced a tremendous outpouring of international support following the Sept. 11, 2001, terrorist attacks. "On September 12, 2001, the French newspaper Le Monde declared ‘We are all Americans.’For the first time in history, NATO invoked Article V of the Washington Treaty and declared the attacks on the United States an attack on every member of the alliance." Passages in Hard Choices are nearly identical to others that appeared in her earlier book, Living History. The State Department had asked me to visit the subcontinent to highlight the administration’s commitment to the region, because neither the President nor the Vice President could make a trip soon. My visit was meant to demonstrate that this strategic and volatile part of the world was important to the United States and to assure leaders throughout South Asia that Bill supported their efforts to strengthen democracy, expand free markets and promote tolerance and human rights, including the rights of women. Back in 1995 the State Department had asked me to go to India and Pakistan to demonstrate that this strategic and volatile part of the world was important to the United States and to support efforts to strengthen democracy, expand free markets, and promote tolerance and human rights, including the rights of women. A description in Hard Choices of Clinton’s reaction to a meal given to her by nomads in Mongolia is similar to one in Living History. In a traditional tent called a ger a family of nomads offered me a bowl of fermented mare’s milk, which tasted like warm, day-old plain yogurt. Inside the family’s ger, every square inch served a purpose. … As is the custom of hospitality in Mongolia, I was offered a bowl of fermented mare’s milk. I thought it tasted like warm, day-old plain yogurt, not something I’d seek out, but not so horrible that I couldn’t sip it politely. Henry Kissinger checked in with me regularly, sharing astute observations about foreign leaders and sending me written reports on his travels. He [Kissinger] checked in with me regularly, sharing astute observations about foreign leaders and sending me written reports on his travels. Hard Choices, which was described by its publisher, Simon & Schuster, as an "inside account" of Clinton’s four years at the State Department, was released last summer to lackluster reviews and published in paperback on April 28. While publishing industry sources said "self-recycling" in political memoirs is not unheard of, the practice is considered bad form and generally frowned upon. Clinton received a $14 million advance for the book. "Simon & Schuster is one of leading and most respected publishing houses in the country," said one publishing industry source. "They certainly didn’t intend to foot a $14 million bill for a book filled with re-appropriated speech material and self-plagiarism, which is probably one reason Hard Choices was a missed opportunity for Mrs. Clinton and her publisher." A spokesperson for Simon & Schuster’s did not respond to a request for comment. Last summer, Clinton supporters attacked Ronald Kessler’s bestseller The First Family Detail—which also puts the Clintons under a harsh light—for "self-plagiarism," alleging that the author reused several passages from his previous work without attribution. David Brock, the founder of Media Matters, published a statement that claimed Kessler "lifted at least 13 stories from his previous books—many times using language remarkably similar or identical to the language he used the first time he told the same tales." The failure to attribute previously published content could raise ethical questions, according to experts. "If you’re trying to pass off something now as something that’s completely original and you’re really just recycling it, maybe that’s not plagiarism but I don’t think that’s an appropriate thing to do without acknowledgment," said Professor Robert Drechsel, the director of the Center for Journalism Ethics at the University of Wisconsin. A spokesperson for the Clinton campaign did not return a request for comment.